Wildwood Plantation is an exclusive organization dedicated to conservation, hunting and fishing in the heart of Louisiana's Sportsman's Paradise. Located on a beautiful historic site on the banks of the Mississippi River, we have over 1,400 acres dedicated to the passion for deer hunting, the love of the great outdoors and the most popular big-game animal in North America. We understand the desire that outdoorsmen (and women) have to pass this legacy on to their children, grandchildren, and future generations and we have provided the ideal facility to accomplish exactly that. While whitetail deer hunting is a primary focus, Wildwood Plantation is rich with game of all kinds, both large and small. It is not unusual to see wild turkey in large numbers as well as squirrels in the trees, rabbits on the ground and a wide variety of ducks in the wetlands. Needless-to-say, proximity to the Mississippi River affords ample opportunity for fishing. For the brave-hearted, there can also be found some of the largest alligators in Louisiana. Thank you for visiting our website. As you browse our pages, we hope that you will get to know us better, understand our history and purpose and let us know about you and your family. We would also like to invite you to become a part of what you will quickly understand is one of the finest outdoor experiences available. Wildwood Plantation was established in 1841; however, its more notable entries into the rich history of Louisiana began with its acquisition by Major Martin Glynn, in 1866. 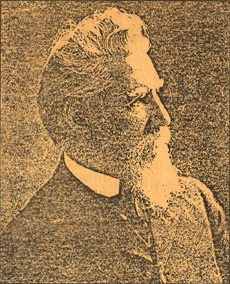 An Irish immigrant, Martin Glynn was born in Erin, Galway, Ireland in 1829 and arrived in New Orleans with his two brothers in 1847. With little in personal assets, Glynn began work at Leeds Foundry in New Orleans and soon applied a good business sense to enter the wholesale grocery business. 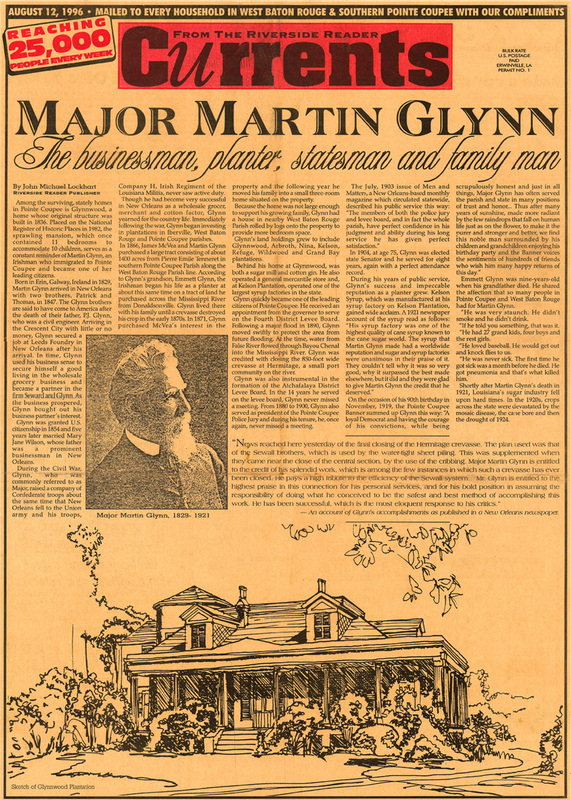 This venture ultimately led to the formation of the Seward and Glynn firm and when Martin subsequently bought out his partner, his financial future was firmly established. His land holdings began to grow and subsequently included the ownership of Glynnwood, Arbroth, Nina, Keelson, Refuge, Grand Bay and, of course, Wildwood plantations. While "planting the land" was his initial venture, Glynn became actively involved in the sugar and cotton industries, operated a general mercantile store and, at Kelson Plantation, maintained one of the largest and most well reputed syrup factories in the state. Today, Wildwood Plantation is proudly owned and operated by Major Glynn's great, great grandson. No discussion of Wildwood Plantation would be complete without mentioning the Civil War. About the same time New Orleans fell to the Union army, Major Glynn raised a company of Confederate troops; Company H, Irish Regiment of the Louisiana Militia. While this force never got to draw Union blood, Major Glynn, nevertheless, contributed significantly to Confederate efforts by providing administrative and medical refuge during the Battle for Port Hudson, a strategic Confederate emplacement on the Mississippi River, directly across from Wildwood Plantation. While the Union "River Campaign," as it has come to be known, had, as its primary focus, the Confederate fort at Vicksburg, Port Hudson remained a thorn in President Lincoln's personally directed battle plan for a period after the Union victory further North. Accordingly, General Grant's report to Lincoln on the victory at Vicksburg was almost an afterthought. It took several days for the message to reach the Capitol, during which time the only remaining Confederate bastion on the Mississippi River, Port Hudson, fell into Union hands. It was only after taking Port Hudson that Grant sent Lincoln a more urgent message advising of Federal control of the entire Mississippi River. Upon the receipt of that communication, Lincoln sighed "Thank God, the Father of waters again goes on decks to the sea".